How are your ears? Are you up for a bit of citizen science listening to the song of the whales? You are invited to “help explore and conserve marine life around the globe, starting with studying and saving the southern resident killer whales of the Pacific Northwest.” That’s some invitation, an invitation hard to refuse. The Orcasound project app sends the sounds picked up by a network of underwater microphones (hydrophones) located in the Salish Sea off the U.S. state of Washington, straight to your laptop, tablet or phone. The idea is to gather data to raise awareness of the damage noise pollution is doing to marine wildlife, particularly the pods of orca for whom the Salish is home territory. And then use that data to better protect these beautiful and iconic creatures. They also use a clicking noise to echolocate prey. Both their talk – keeping them with their pod and passing on information – and their clicks – finding food – are critical to their survival. Underwater noise pollution could so disrupt this natural behaviour as to wipe them out. 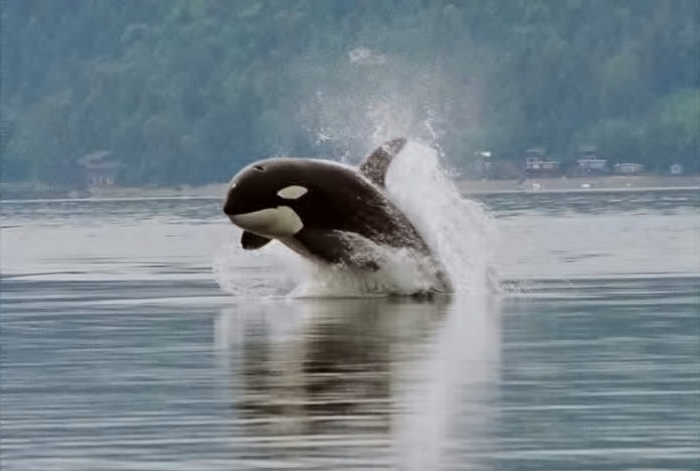 Minky whales and humpbacks as well as harbour porpoises frequent the Salish Sea. So before we make a start at listening to orca song, to help us distinguish one underwater sound from another Orcasound features an interactive image of Salish sealife. We can click on any of the ‘objects’ in the image, animate or inanimate, and hear the different sounds each produce. Now we’re all set to go. A killer whale “porpoising” in the Hood Canal waterway, south of the Salish Sea in the U.S. state of Washington. Image by Minette Layne via Wikimedia Commons CC 2.0. Wildlife Tourism – Good or Bad for the Animals?